Che xoi nuoc (also called che troi nuoc and banh troi tau) doesn’t translate well–literally sticky rice water dessert. But what it lacks in translation, it makes up in flavor so uniquely sweet and savory. Basically, it’s a sticky rice mochi filled with savory mung bean filling bathed in a sweet ginger sauce, served warm and topped with rich coconut milk reduction and toasted sesame. Now that sounds a lot better than sticky rice water right? 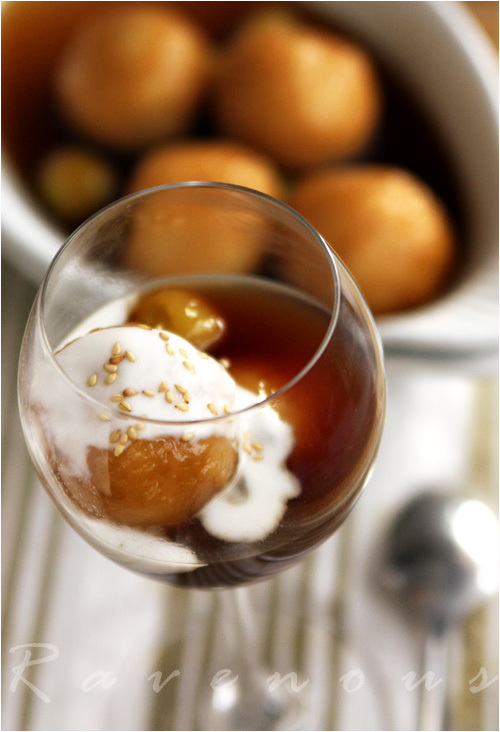 This dessert is similar to the Chinese Tangyuan, often served during the lunar new year. If you’ve read our posts on banh it tran, a savory sticky rice dumpling, the ingredients and process are almost identical. So if you’re going to make banh it tran, split or double the ingredients and you can make che xoi nuoc at the same time. The filling can be sweet or savory mung bean filling and we’ve seen variations with sesame paste. We prefer the savory filling–it just adds a complexity between the sweet ginger syrup mixed with the mung beans. This recipe has multiple components and requires planning but once you get the different ingredients together, it’s so simple to make. You can make the mung bean filling, ginger sauce, and the coconut sauce the day before to save time. First make the ginger sauce by mixing water and brown sugar in a sauce pan. Add the cinnamon and ginger. We like to put the crushed ginger in a large tea strainer or bag of cheese cloth to make it easier to remove, but if you don’t have that just toss it in and strain later. Bring to a simmer for about 15-20 minutes to get the flavor from the ginger steep out and turn off heat. Set aside and strain ginger pieces when ready to add the mochi dumplings. This is a sauce, not a syrup so no need to reduce to a thick consistency. While the ginger sauce is simmering, steam the mung beans for about 15 or until you can crush the grains with your finger and allow to cool and dry slightly. Meanwhile with about a 1 tbs of cooking oil quickly sautee the green onions for about 30 seconds and set aside. Add another 1-2 tbs of oil and sautee the onions until golden brown, drain oil and set aside. By now the mung beans should cooled. Add mung beans to a mixing bowl and using a rubber spatula work the mung bean into a paste. Add in the onions, green onions, salt, sugar, coconut milk and mix well. Adjust seasoning to taste–but remember, this filling will be in a sweet ginger sauce so you don’t want the filling to also be too sweet. 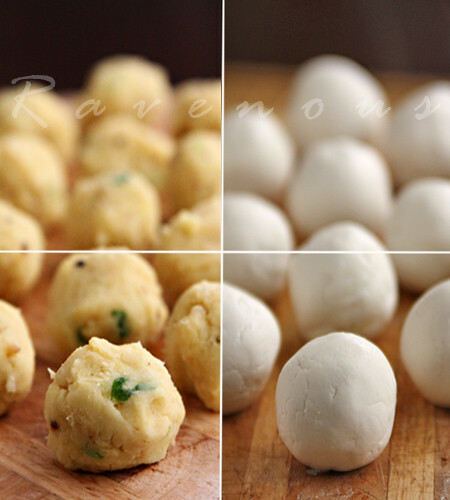 Make small balls of mung bean filling roughly the size of a quarter in diameter and set aside. Add the glutinous rice flour and the 1 3/4 cup of water to a separate mixing bowl. 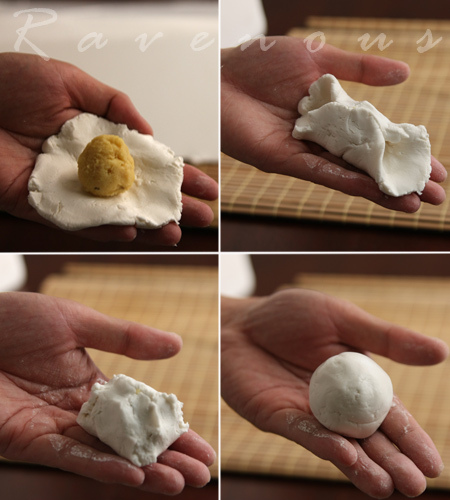 Mix well and form into a dough ball–it should be like play dough consistency. Pinch a small ball of dough and flatten it out into a thin disk roughly 1/8 inch thick and twice the diameter of the mung bean filling. Place the mung bean filling in the center of the dough. Fold over one edge and pinch together. Then fold and pinch the ends together. Pinch off the excess dough at the edges, making sure the filling is complete surrounded by dough. Then gently roll the dumpling in your palms to form a smooth ball. If you have excess dough, roll those into small pearls–don’t discard! Bring a pot of water to boil and add the mochi dumplings and any small pearls–don’t add too many and leave a bit of space between each dumpling. Stir occasionally making sure it doesn’t stick to the bottom of the pot or each other. Dumplings are cooked when it rises and floats. Remove to a colander rinse with cold water, drain, and add to the ginger sauce. The dumplings begin to immediately take on the amber color and should be complete submerged in the sauce. Add the coconut milk, salt, and sugar to a small sauce pan and reduce by about a 1/3 or until a thick consistency and set aside. 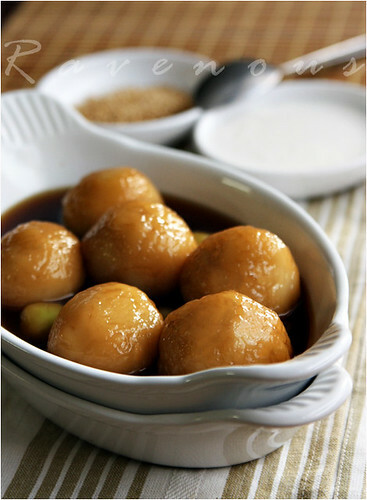 Allow the dumplings to soak in the ginger sauce–the longer the better and serve this dessert warm. If stored in the fridge, microwave the dumpling and the sauce for about a minute as the mochi tends to harden in the fridge. Top with the coconut reduction and sprinkle toasted sesame. Che xoi nuoc is a wonderful dance of sweet and savory flavors and textures. It’s a Vietnamese comfort dessert at it’s best. This post is a tribute to our moms who guides us in recipes as well as in life. Happy Mother’s day weekend everyone! It’s also our contribution to Delicious Vietnam, a monthly blogging event celebrating Vietnamese cuisine created by Anh of A Food Lovers Journey and yours truly! This month’s host is also A Food Lovers Journey . Yummyyyyy! Thanks for posting this recipe. I have fond memories of my Mom making this. I'm going to have to try to make it soon. Thanks again! Julie: che xoi nuoc just brings back so many good memories for people! Bao: she'll love you even more for it! if you make it, remember to take photos! Such a unique and absolutely scrumptious looking dessert! I would love to try it! I've had something similar before. Soooo good. I love the ginger sauce. Of course, I'm a big fan of ginger. Wow — that looks so delicious! Just printed the recipe & I can't wait to try it! Thank you for sharing! I love the soft chewy texture of this dessert. The ginger sauce is new to me, but it looks oh-so-maganificent! We eat mochi in ginger flavoured soup but this looks much better with the touch of coconut milk and sesame. I love all these flavors on your blog, they're so exotic to me. 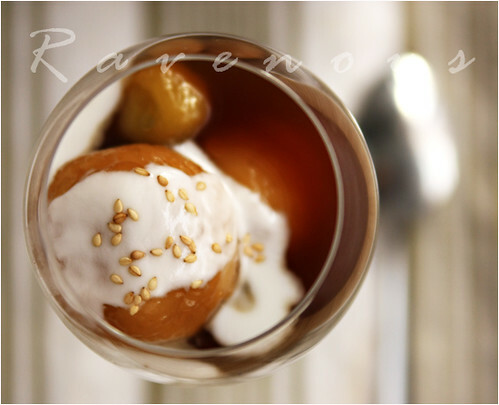 5 star foodie: Vietnanemese are not known for their sweet tooth, but their desserts are still very good! Jenn: The "nuoc" refers to the ginger sauce and yes, people love to drown the mochi in it. 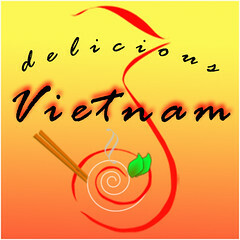 KitchenRunway: Let us know how che xoi nuoc goes! FLB and Pigpigscorner: Other asian cultures have similar mochi desserts, the ginger sauce along with coconut and sesame is a vietnamese thing! Dinners and Dreams: thank you for stopping by our blog! How utterly gorgeous! I want some! (I don't want to make them – not right now anyway- I want someone to make them for me!) O dear I needed a mum who made these!!!!!! Goodness I am salivating. Sadly many of these ingredients are not available in my part of the world. Still I end up bookmarking almost everything you post. A girl can't help but dream right? Joy: Thank you! many vietnamese delis serve this…if you can find one, try it! I love the flavor profile of the filling. The interplay of sweet, savory, and spicy notes is just harmoniously yummy! Doesn't mind how it is translated : ). 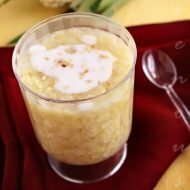 Having this sticky rice mochi in ginger sauce is one of my favorites and yours looks inviting with coconut milk in a glass. Tuty: that's the thing with Vietnamese desserts..it's not overwhelming sweet or decadent..
tastehongkong: you're right…food and good flavor transcends language! john: that's great..hope you post up the tang yan recipe soon! I don't really like most che, but this is one of my favourites. I really like the combination of the salty filling and the sweetness of the remaining ingredients! Don't think I have tried any Chinese tang yuen similar to this! The filling is savory while sauce is kinda hint of sweet? Wow! impressive! good job you guys. i love that i have such a great resource to learn classic vietnamese cooking! Aw, gorgeous pictures! Love every kind of mochi with sweet ginger sauce, very delicious. Believe it or not I have never tasted this version of mochi dumpling! (Okay, I did, but it was not so good. I think I used too much shallot). Love the step-step photos! Ellie: Thank you! Yes, some people drink it like soup! Nina: Vietnamese desserts are under-rated, but this one seems to be alot of peoples favorites even if they don't like dessert. Tigerfish: well it's similar because of the glutinous rice but from there it diverges radically! Christine, Anh and Ana: Thank you! Krissy: Thanks, glad to be here! Yay! Thanks guys for posting this recipe. I will try it soon, as this is my all time favorite dessert. It's chewy, sweet, savory and lots of nutty goodness. I tend to add lots of toasted sesame or a substitution of almost finely chopped toasted peanuts. My mother used to make it when we were little but since there has been a lack of interest of her cuisines she stopped making yummy stuff. What a lovely recipe! That ginger sauce sounds to-die-for and I think I could find many uses for it. The rice flour dough is amazingly sticky. Clear some space and keep a wet towel on hand. The dough is so sticky that you need to think carefully about where you put the formed dumplings before you throw them in the pot. Stacking 24 of them in a mixing bowl is a profoundly bad idea and will lead to you losing over half the batch as the dough seizes together. It might be best to form the balls and immediately drop them into the pot. 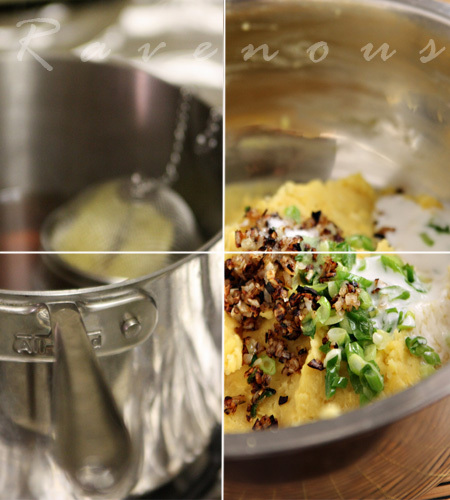 When steaming the mung beans, don't settle for "smush-able." Wait until they really fall apart under the slightest pressure, or the filling won't come together as a smooth paste. Thanks again for another recipe that had be doing brand new things in my kitchen! Now I'm ready to try and make those tasty sesame balls that I always grab with my bahn mi at Lee's! Andrew: you have a great attitude! Yes, you need to keep the dumplings separate or else it will stick. Definitely only boil 3-4 at a time…but was it a complete failure? Thank you again for dropping off your leftovers. Che troi nuoc is my absolute favorite!! Thanks so much for the description… I was blogging about it but couldn't find the words to describe/translate che xoi nuoc! Look so good, my mom makes this che` using white sugar for the sauce, so it doesn’t look this nice. I’ll definitely try brown sugar and the coconut sauce next time. Love it. I love all the photos on your site…it makes me hungry everytime I’m on here. I just wanted to double check if the measurements for the filing are correct. I used 2 tsp. of salt and it seemed like a lot to me but followed the recipe to the T. The filing came out extremely salty. I will definitely use this recipe again but will probably cut back the salt to 1/2 a tsp. Otherwise, I really liked all the flavors together. I’ve never tried onions in there before. This is one of my favorites, and I never knew how to make it. 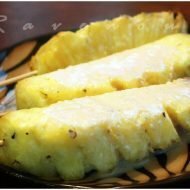 Thanks, for posting this recipe! I am going to try it out this weekend. I can’t wait to have these flavors burst in my mouth… It’s been too many years since I’ve enjoyed this dessert. I made it and it was wonderful! I refrigerated it for a few days and I heated it up prior to serving and the mochi balls are really hard. Do you know what I can do differently to the flour to not make it hard if I am going to refrigerate it for about 1-2 weeks? I want to make a lot at a time since it’s so much work =(. Thank you! rice flour tends to harden after a few days. maybe make it and freeze before cooking? the trick to get the mochi balls soft is to replace water with the asian coco-rico soda. Thanks for the recipe! I just finished making it and it tastes so good..not too sweet like the ones I can buy at my Asian grocery. I never knew how easy it was to make this! Thanks again guys! Will be trying other recipes from your site. This is everyone’s favorite “warm” che. I helped my mom make it growing up but have not made it in many years. I loved it as a kid and still love it as an adult. It’s one of those favorite recipes that you never outgrow. Yours look beautiful!